Projection screen 1.75 m Made for front projectionWith Stand.. Projection screen 2 m Made for front projectionWith Stand.. 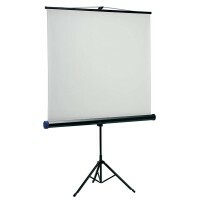 Projection screen 2.44 x 1.8mAvailable with front and rear projection screenFast fold design.. Projection screen 3.05m x 2.25mAvailable with front and rear projection screenFast fold design.. Projection screen 4m x 3mAvailable with front and rear projection screenFast fold design..